BELLEVUE, Kentucky -- With its charming tree-lined streets, quaint eateries and well-preserved Victorian homes, it’s no wonder Bellevue’s Fairfield Avenue historic business district is one of the region’s best-loved neighborhoods. That community spirit is alive and well in Bellevue, and a current wave of development is bringing considerable energy -- and attention -- to the once-sleepy community. The challenge now will be for leaders and residents to manage the change without losing its signature charm. One group helping Bellevue strike that balance is the team that introduced the Old Kentucky Makers Market craft fair and street festival to Bellevue last year. The fair kicked off again June 17 with food from Eli’s BBQ and craft beer from Bellevue newcomers Darkness Brewing as well as Braxton Brewing Company, which recently launched a second location at The Party Source. The summer festival will resume with events Aug. 11 and Oct. 7 featuring popular local bands, food, drinks and more. The Bellevue Urban Renewal Community Development Agency is another group making significant investments to preserve Bellevue’s unique identity while attracting visitors and new residents. The group has worked to rehabilitate aging building facades along the main Fairfield thoroughfare and support the Bellevue Neighborhood Association in installing planters and hanging baskets along the picturesque corridor. Fairfield Avenue businesses range from secondhand and novelty stores to curbside cafes and professional firms such as Mackey Advisors, which in 2012 scaled a LEED-certified transformation of the company’s historic headquarters at 601 Fairfield Ave. In addition to fostering collaboration between the residents and business owners who call Bellevue home, leaders express a strong desire to strengthen relationships with the neighboring river cities of Dayton, Newport and Covington. A major opportunity arrived in that regard when in February the city ended a yearslong litigation, resulting in the purchase of a parcel of riverfront land known as Harbor Greene. Bellevue resident and regional planner Kevin Wright was part of the team that led a series of public forums called Engage Bellevue to gather community concerns and ideas for developing the land. Wright’s team released its Engage Bellevue findings last month, and while preliminary planning and budgeting phases are still in the works, Wright says leadership is on pace to begin searching for a community-focused developer later this year. “The ideal partner will be someone who is committing to showcasing Bellevue’s riverfront as a destination for residents and visitors with vibrant, accessible public spaces and food and retail that exemplify our local culture,” said Wright. 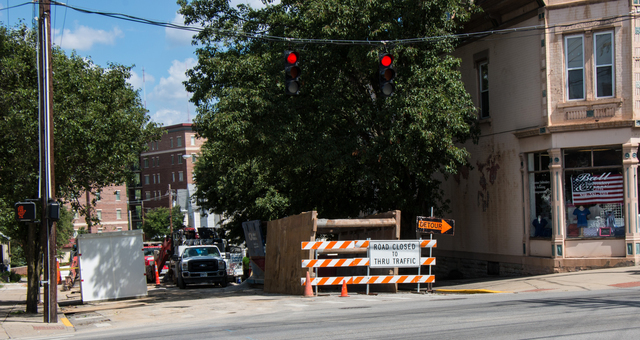 Fairfield Avenue’s wave of momentum -- along with its residents’ patience -- may soon be tested, however, based on last week’s announcement that a major intersection at Fairfield and Taylor avenues will be closed for four weeks as Sanitation District 1 works to repair a crumbling sewer pipe. “This will be a challenging time for all our residents, as well as Dayton’s, and our entire business district, which correlates directly to the health of Bellevue,” said Robinson. “But at the same time, we suddenly have space to activate in an interesting way -- a ‘living room,’ a park, a place to bring people together. This could be the type of place and opportunity we heard about in our Engage Bellevue interview process.